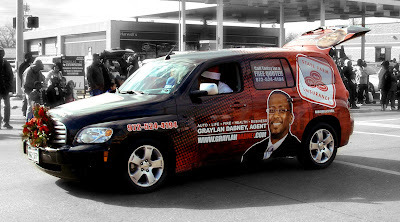 Today's photo is another entry from the Terrell Christmas Parade last Saturday - this is the local State Farm insurance agent Graylan Dabney, whose office is located right behind the local gym where I've been working out these past few months. There has been a new office building under construction on hwy 205 south of Wal Mart where Mr. Dabney's insurance agency will be relocating to when completed, according to signs out in front of the new building. I think this car and the idea for decorating vehicles like this is really cool - I just don't know that I'd do that for my personal car. I mean really, you could never do anything wrong because people would know exactly who you were when you did it. Go to the liquor store too much? everyone would know. Out at the donut shop every morning? Gotcha! Pulled over for running a red light? People see your pic and know its you! Thank you very much for the post and thanks for giving the link. I’ll check it soon. Lol, I think you are right. Although, being in the public eye doesn't seem to deter bad behavior in some of our notables in the political and entertainment industries! BTW, being the cat lovin kind of guy you are, you will probably get a kick out of my post today.